When I first started maintaining “play” servers on the internet, in order to run my own blog and various software projects, the build process was long and laborious. That would have been around 2009, and at that time I was working for corporate logistics provider whose Disaster Recovery time was measured in days, not minutes. This was before serious server orchestration tools came onto the horizon (Ansible, Salt, Chef, Puppet) and well before the popularisation of lightweight containerisation, in which Docker now plays a central role. However, the Linux technologies that Docker makes use of under the hood (namespaces and cgroups) have been around for years in similar guises elsewhere: LXC in Linux, and before that, Jails in FreeBSD. 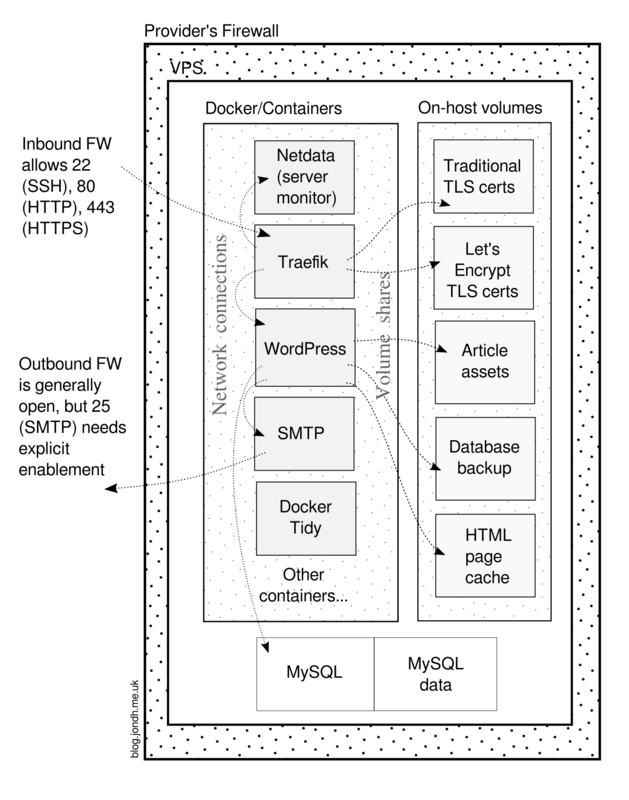 It’s interesting to ponder why Docker has only just exploded in popularity, but I’d wager it is the tools that Docker has now build around containerisation, and not container technologies themselves. The Dockerfile, the layered filing system, the caching of layers, easy networking, all the stuff you get automatically in Docker Compose — the list goes on. Perhaps the mass availability of cloud server virtualisation has contributed to where we are today. I used to rent a 512M server for 15GBP a month, with rotating disk storage, and now I can have a machine with double the RAM, free additional cloud features, and significantly better performance, with SSD storage, for around 6USD a month. We’re at the point now where running a number of applications in Docker costs the same as two cups of café coffee per month, and I recommend it to every web software engineer (of course, one can sign up to free VPS offers from the likes of AWS, but they tend to be time-limited). There are a few other web apps to be moved from my previous VPS, but this is a good start. Let me first present the solution I ended up with, and then I’ll walk the reader through it. There was not actually much of an architecture plan to start with – it was fairly organic, with a few wrong rabbit holes! It finally ended up looking like this: I knew I wanted more than one HTTPS site: this blog, some server monitoring software, and the ability to add more in the future. That would require that they share a web server, since only one process can bind to port 443, and I only have one IP address. Since there’s more than one Docker process with its own web server, this was not possible, and so I needed a frontend proxy to forward traffic to the correct subsystem. While Apache/mod_proxy and NginX are capable of doing this, I previously had a good experience of Traefik. This is a highly configurable proxy device, written in Go, and capable of interfacing with all sorts of orchestration and configuration stacks. It will also set up and renew Lets Encrypt TLS certificates automatically. Of course, this can be used within a Docker container itself, with the external web ports bound to the public IP on the VPS. For now, I’ve put MySQL on the host itself. In the early days of Docker, there was some worries about data corruption in containers, though I expect they’re resolved now. I suspect that while the data ought to stay on a host volume, the server itself would be just fine in a container. The server set-up is pretty simple as it is, but moving the MySQL configuration to a buildable Docker repo would be even nicer. I wanted all of these containers to have a restart policy (so they respawn if they crash, and on server boot) and also to delete the container on exit, since none of them should store any state. However, it turns out specifying both --restart and --rm is not permitted, so I had to work around it. This is the purpose of Docker Tidy: each container has a Docker restart policy, but containers persist after stopping. Thus, this process sweeps up dead containers daily, to keep things clean, and to ensure the disk is not overwhelmed. # known_hosts to this repository (see https://stackoverflow.com/a/29380672). # php7-gd is required for ? An example of a start script is given in this answer. Together with MySQL on the host, and the OS itself, it takes around 0.5-0.6G RAM, which on my 1G RAM machine at Vultr is pretty comfortable. I’ve made some tweaks in WordPress’s Apache so that it doesn’t spin up too many worker processes (the default was taking 250M of RAM, so I’ve reduced the number of workers, and removed some unused Apache modules; it looks like it’s maxing out at ~150M now, and usually it lurks below 100M). I’ll shortly be adding a couple more web apps, and it’ll be interesting to see how the memory consumption responds. When building this server, I considered using Docker Compose, especially since that helps deal with some of the dependencies (e.g. WordPress needs SMTP, and Traefik needs WordPress). However, it didn’t feel quite right at the time, since DC strikes me as being suitable for an application (where everything has a dependency) rather than server configurations (where only some services are independent). Nevertheless, I may look into that that again. One of the main deficiencies of my set-up is a strict versioning of images, which I will tackle next. This may start off as a script to tag new images pulled from my private registry, but at some point, I expect implementing a Swarm or Kubernetes stack will give me that feature. That will allow me to roll back to earlier images if a newer one fails. I’d also like to set up memory limits for containers. Although the tweaked Apache configuration seems to be behaving itself, it would be nice to add some belt-and-braces. Docker should have some options to set this in the run command. I also plan to move some containers to continuous deployment, direct from CircleCI. Presently the process is based on a manual pull, retag and restart operation, and that should be fairly trivial to automate. Watch this space!